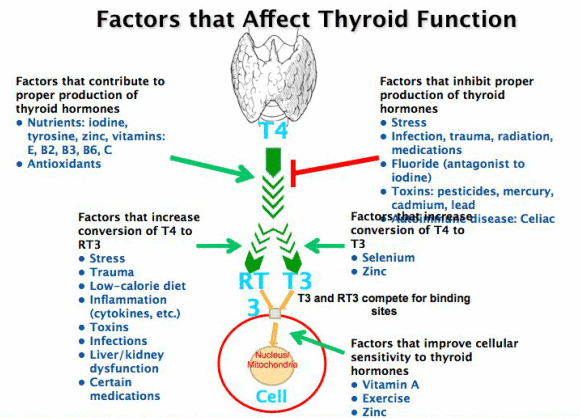 Free T3 levels are THE most important measure of thyroid function. Because T3 is the active thyroid hormone in your body, it does all of the heavy lifting when it comes to thyroid function. Everyone wants to have "normal" free T3 levels because that's how you optimize thyroid function and feel better. There's an easy way to increase free T3 levels and there's a not so easy way. The easy way to increase free T3 is by simply taking T3 thyroid medication like Liothyronine or Cytomel. This strategy works well if you have a Doctor willing to work with you and change up your medications. If you don't then you'll have to be smart about how you approach thyroid function. Taking the natural approach and doing everything in your own power to increase your free T3. Is it Possible to Increase Free T3 Levels Naturally? There are actually many different factors that are within your control and each of these factors may be acting like a "brake" on your thyroid function right now. The goal with treatment is to "release" the brake and allow your body to function to whatever capacity it is capable of. To get to this point you need to understand the most common problems that may be slowing down your thyroid function and acting like a brake on the system. This image outlines the steps that thyroid hormone must go through before it is activated and able to function in your body. Each step in the image is a potential place that can "slow down" thyroid function and lead to downstream problems in thyroid hormone metabolism. From the image, you'll notice that there are several key vitamins and nutrients involved in each step. You'll also notice that several environmental factors can also influence these steps. Our goal will be to focus on these steps to naturally enhance thyroid function. There are many nutrients that are required to create thyroid hormone in the body, in addition, several are involved in the conversion of T4 to T3. You can imagine a scenario in which a minor deficiency in any of these nutrients may cause big problems for your thyroid. In a world where the soil is depleted of nutrients (3) and where we often eat unhealthy and processed foods (4), it's easy to see how we can be deficient in some of these major players. And that's exactly why you want to ensure that you have enough of these nutrients in your body. Even though there are at least 15 major nutrients involved in regulating thyroid function at all three levels, you don't need to necessarily worry about every single one. Some nutrients tend to become deficient more readily compared to others. For hypothyroid patients, nutrient deficiencies in Zinc, Selenium and Vitamin B6 tend to be more common than deficiencies in fat-soluble vitamins (5) such as Vitamin A, C, and E.
Yes, vitamin C and Vitamin A are important - but for the most part, people aren't commonly deficient in these (though you still may want to ensure that you are not before you skip supplementing with them completely). So, how can you replete these nutrients if you suspect (or know) that you are deficient? The first is through your diet and the second is through over the counter supplements. Consuming vitamins through your diet is the ideal approach but it can be difficult. If you are already eating a healthy diet, and you still suspect you are deficient, then supplementing may be your next best step. But not all supplements are created equal. Some, low quality and cheap vitamins, contain the wrong formulation of vitamins or contain fillers and dyes which may make absorption difficult. You can bypass these problems by only purchasing supplements from reputable places (avoid using grocery store brands and Amazon brands). Zinc - Zinc helps convert T4 to T3 so inadequate levels will make your body more likely to convert T4 into Reverse T3 and may make your thyroid function worse. Zinc is also a powerful anti-inflammatory agent and it may help regulate the immune system (6). Selenium - Selenium helps convert T4 to T3. It can also help balance the immune system and has been shown to be effective in helping reduce antibody levels in Hashimoto's (7). Vitamin B6 - Vitamin B6 helps create thyroid function and it also helps create and maintain neurotransmitters in the brain. In addition, it's required for normal and healthy brain development! You can get B6 in a B Complex or in most adrenal supplements. I recommend using a combination supplement with contains both Zinc and Selenium such as this one. These aren't the only nutrients involved in regulating your thyroid, so be sure you also evaluate for other deficiencies as well. Most people, based on my experience, tend to notice some improvement when replacing basic nutrient deficiencies. The benefit that you may obtain likely depends on the degree of deficiency (if present) in your body. Your gastrointestinal tract does much more for your body than just absorbing nutrients and food. It's best to think of your gut as an organ system which contains its own hormones, neurotransmitters and is an active participant in your overall health. As it relates to your thyroid, your gut may help your body "activate" up to 20% of thyroid hormone (8). It turns out that the composition of the bacteria in your gut matter a lot when it comes to optimizing your T3 levels. It's very possible that you may have some gut related issue because of the way that thyroid hormone influences the GI tract. Thyroid hormone helps your stomach produce stomach acid (9) and it also helps your intestinal tract move forward at a normal pace (10). When thyroid hormone is low your intestines move slower (predisposing you to constipation) and making you more likely to develop conditions like SIBO (small intestinal bacterial overgrowth), Yeast overgrowth and Acid Reflux. Gut issues can also further worsen nutrient deficiencies as stomach acid falls (11) due to malabsorption. All of these conditions predispose you to develop a condition known as increased intestinal permeability (12)(also known as Leaky Gut). When your intestinal barrier becomes less effective (AKA you develop Leaky Gut) an endotoxin known as LPS can get through into your blood stream. LPS directly lowers T3 levels in the blood (12). Now that you understand how important your gut is for your thyroid the next big question is what can you do about it? The first step is a diagnosis. In many cases, a thorough history of your intestinal function, including your symptoms, is enough to help direct treatment and diagnose gut related issues. Are you experiencing bloating, gas or abdominal pain 30-60 minutes after a meal? You may be suffering from a combination of SIBO +/- Yeast overgrowth. Do you get a metallic taste in your mouth when you lay down at night or do you get a burning in your chest after eating certain foods? You may be suffering from acid reflux or GERD. Do you suffer from chronic constipation, pain with bowel movements or alternating diarrhea and constipation? You may be suffering from intestinal dysbiosis or irritable bowel syndrome (13). Are you experiencing depression, acne, seasonal allergies, asthma, autoimmune disease or any of the above symptoms? You may be suffering from increased intestinal permeability or leaky gut. By evaluating your symptoms and history you can usually get yourself started in the right direction. Addressing these gut related issues may help to improve the intestinal concentration of bacteria in your gut and may, therefore, help improve your thyroid. Treating each of these can be very tricky and may take anywhere from 3-6 months (or longer!) depending on the severity. Consider using a digestive Enzyme - Digestive enzymes help your body break down food and help absorb nutrients. They can also help to break down immune complexes in the blood to help treat autoimmunity. Consider using an ﻿Ultra potency, multi-strain probiotic - High potency, multi-strain/species probiotics can dramatically reduce local inflammation in the gut and even reduce systemic inflammation. Patients with hypothyroidism/Hashimoto's should ALWAYS use a high-quality probiotic for 2-3 months and then switch to a daily probiotic for maintenance. Use Essential Oils to kill off bacteria and yeast - Essential oils have been shown to be as effective as antibiotics in treating SIBO (14). I recommend using a combination of Oregano oil, Thyme, and Berberine. ​Use these to help get you started, but realize you may need further testing to completely fix your gut. In case you aren't familiar with Reverse T3, I will fill you in. You can think of Reverse T3 as an anti-thyroid metabolite that your body creates under certain conditions. It acts by directly inhibiting or blocking the actions of free T3 (15). This is not a good thing! (You do not want this to happen in your body). Reverse T3 is the product of evolution and its function is to act as a natural "brake" on your metabolism in cases of emergency. If you are critically ill or sick from some life-threatening infection, you want your body to focus on killing the infection and not on growing your hair follicles. Your body directs energy into certain tissues by manipulating reverse T3 levels. Unfortunately, it can very easily get out of balance due to a number of conditions including Insulin resistance, Leptin resistance, inflammatory states and the use of certain drugs (anti-depressants, beta blockers, mood stabilizers and pain medication). ​When this happens reverse T3 levels rise and they directly BLOCK your free thyroid hormone. Because of that, you want this guy as low as possible. You can easily evaluate your reverse T3 level with a simple blood test known as reverse, Triiodothyronine. By checking your reverse T3 you will be able to determine if this is a problem for you or not. Because of the importance of reverse T3 on thyroid function, it's always a good idea to order reverse T3 when you check for other thyroid markers such as TSH, free T3, and free T4. You'll want your reverse T3 to be as low as possible and definitely less than 15.0 ng/dL. Get on T3 only medication (Like liothyronine or Cytomel) - Using T3 only thyroid medication will directly increase your free T3 and overpower existing reverse T3 competition. It also acts to help reduce Free T4 levels in high enough doses. High-intensity interval training - Adding HIIT will help your body create a demand for thyroid hormone and help "push" T4 down the T3 path and not the reverse T3 pathway. Stop restricting your calories - Calorie restricted diets create a "starvation state" which your body responds to by increasing reverse T3 conversion (16). This will ultimately make weight loss more difficult. Reverse Leptin and Insulin Resistance - High levels of Leptin and Insulin tell your body to create MORE reverse T3. Read this guide on how to reverse Leptin Resistance here and how to reverse Insulin Resistance here. Adequate iron levels are required for optimal thyroid function. Studies have shown that the level of iron correlates with TSH activity and cellular thyroid function (16). This means that if you have low iron then your thyroid function may be impaired and contributing to your current set of symptoms. One easy way to assess for iron in your body is with the use of ferritin. Ferritin can be easily ordered through routine lab work and can give you an idea of the status of iron in your body. Low ferritin may indicate that you have low iron stores while high iron may indicate that you have high iron stores. When it comes to iron you want to try and get just enough. That's why I refer to Iron as a "Goldilocks" kind of nutrient. Too much may cause iron overload and lead to inflammation (17) while too few may lead to impaired thyroid metabolism. Low Iron makes Thyroid medication less effective - Iron is required for proper T4 to T3 conversion. Low iron = low conversion. Iron is required for adrenal function - When your adrenals aren't working they put increased strain on the thyroid and lead to adrenal fatigue and adrenal burn out. Hypothyroidism leads to Iron deficiency - Thyroid hormone is required for Iron absorption. When thyroid levels are low it leads to iron deficiency which in turns worsens thyroid function in a vicious cycle. Hypothyroid patients tend to do well on Liquid Iron (instead of Iron tablets) - Remember when I said that Hypothyroid patients tend to get constipation? Well, iron tablets can actually make constipation worse. For that reason, it may be preferable to use liquid iron to reduce gastrointestinal upset. When you are evaluating your serum ferritin you'll want to look for levels in the 40-60 ng/mL range. Values less than 40 ng/mL may be contributing to hypothyroid symptoms (18) and thyroid dysfunction. You can treat low ferritin with the use of over the counter iron supplements such as liquid iron or iron tablets/capsules. Remember when I told you that 20% of your thyroid is activated and converted in the gut? Well, a large majority of what's left is converted in the liver. Some estimates put it as high as 60% (18). Which makes your liver one of the most important organs for ensuring that your thyroid hormone is metabolized correctly. Dysfunction in your liver, including inflammation of the liver from diseases such as NASH or NAFLD may contribute to decreased thyroid metabolism. You can evaluate liver function with standard "liver function tests". Liver function tests are an easy and quick way to assess liver function. Liver damage is becoming more and more common due to our diet and its impact on insulin resistance and blood sugar levels. If you find that your LFT's are even slightly elevated then you will want to look at your blood sugar and insulin levels as well. Other conditions can cause liver issues, but by far insulin resistance is the most common (19). Optimizing your liver function may result in the highest increase in T3 levels of any other therapy. Another important way to increase your free T3 is by focusing on your adrenals. Your adrenals sit on top of your kidneys and they produce important hormones such as cortisol and adrenaline. These hormones are released during times of stress, so the more stress you are under the more hormones your body will produce. This is a good thing, up to a certain point. But if this system is overstimulated then it can start to drag down other hormone systems such as your thyroid. It has been shown that as cortisol increases (20) your TSH may increase as well (thus, potentially making thyroid function worse). 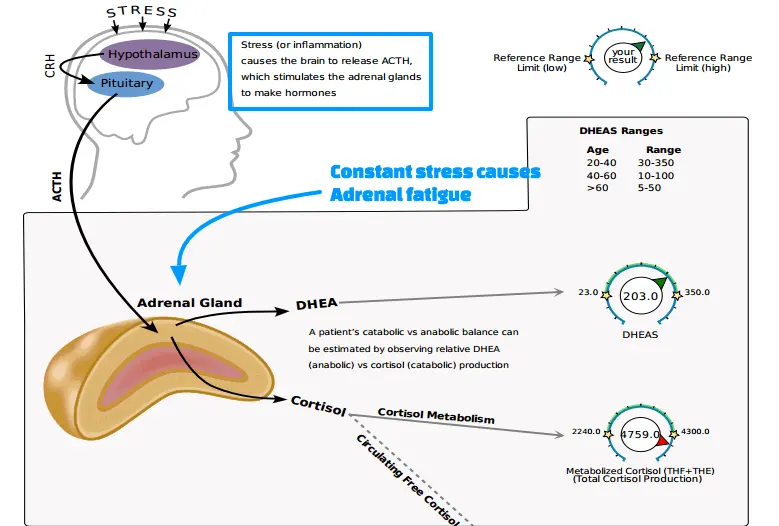 Consider taking an Adrenal Supplement - Adrenal supplements contain important ingredients such as adrenal adaptogens and/or adrenal glandulars. These are vitamins that may help your body tolerate stress and reduce the impact that further stress has on your hormones. These vitamins have been studied and shown to impact cortisol as well (21). Cut out Caffeine - The use of caffeine may act as a stimulant and put increased strain on your adrenals. If you find that you are reliant upon caffeine for "energy" then that may be a sign you need to cut back. Consume extra salt - Salt helps to nourish the adrenals and is required for the creation of certain adrenal hormones (22). Calm down with Yoga or Meditation - These stress relieving activities may help lower cortisol and cut down on the demand from your adrenals. Replace other nutrient deficiencies - Other nutrient deficiencies can potentially make adrenal-related symptoms worse. You can find a list of supplements to help support your adrenals here. Iodine is another important nutrient involved in the creation of thyroid hormone. Iodine deficiency may result in decreased substrate and may, therefore, lead to reduced thyroid hormone production. Iodine deficiency is more common than previously thought because the primary source of iodine in humans is from our diet. Soil depletion of nutrients, an avoidance of sea-vegetables, and a preference for using non-iodized salt have led to reduced ingestion of iodine. These factors may contribute to iodine deficiency and may potentially lead to reduced T3 levels. Despite this, iodine supplementation is not as straightforward as you might think. Some studies have shown that the consumption of iodine, without other nutrients such as Selenium, may lead to an increased risk of developing Hashimoto's thyroiditis (23). If you are going to trial iodine it's best to start low and increase your dose slowly - Your body needs around 150-170mcg of iodine per day and you may not want to use doses higher than this initially. If you have Hashimoto's and you want to trial iodine make sure you take Selenium with it - Supplementation with iodine, in cases of concurrent selenium deficiency, may trigger inflammation and thyrocyte damage. If you've tried other supplements and have symptoms of iodine deficiency (like fibrocystic breast disease) then it may be a good idea to consider iodine supplementation. I can't overstate the importance of lifestyle changes when it comes to improving thyroid function and T3. 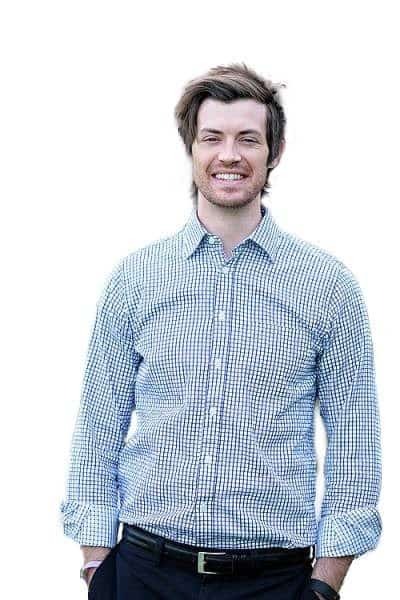 I use lifestyle changes as a broad term to include the food that you eat, how often you move or exercise, the amount of sleep you get and how stressful your life is. In my opinion, these 4 lifestyle factors create the foundation upon which everything else is built. These factors help influence inflammation in your body, help regulate neurotransmitters and help ensure the production and function of other hormones. By combining these changes with supplements, medications, and the other therapies listed in this post, you will set yourself up for the best results possible. Failure to set this foundation will severely limit your results! And in this case, may result in decreased free T3 levels and increased reverse T3 levels. What if you've tried these therapies before and they haven't worked? If you've exhausted this list of natural therapies then it may be time to consider using T3 thyroid medication. T3 thyroid medication is the quickest way to increase your free T3 because, by using it, you are providing your body with the very hormone you may be deficient in. Your thyroid gland naturally produces T3 thyroid hormone (about 20%), but the addition of T3 medication can also be very helpful. This is especially true for individuals who have undergone thyroidectomy or radioactive iodine ablation. You can also obtain T3 thyroid hormone in combination medications such as Natural Desiccated Thyroid (NDT). Some physicians don't believe that using T3 thyroid hormone is necessary so you may need to seek out a second opinion if your Doctor is unwilling to prescribe this medication. Newer studies show that the combination of T4 with T3 thyroid hormone helps reduce the symptoms of hypothyroidism and improve quality of life (24). It is possible to take action and to naturally improve your free T3. The best way to accomplish this goal is to focus on the variables which may negatively impact thyroid function in your body. By focusing on factors such as reverse T3, inflammation, nutrient deficiencies, adrenal function, iron status and your lifestyle, you may be able to positively impact your T3 levels. If you find that you are unable to obtain symptomatic improvement, despite utilizing the tips here, you may need to consider altering your thyroid medication and adding T3 thyroid medication to your regimen. Lastly, don't forget to look at other thyroid lab tests which can give you valuable information about your thyroid gland and its function. What have you done to increase your T3 levels naturally? Have you been able to find out why your T3 levels may be low?